A drunken man who threatened a police officer with violence has been detained. 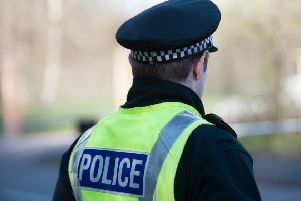 Daniel Gauld (20), 67 Deanfield Road, Bo’ness, told a police officer he would bite off their nose . He also brandished a piece of wood at police who were called to attend an incident in the area on September 2. Appearing at Falkirk Sheriff Court last week, Gauld had pled guilty to swearing, uttering threats of violence and assaulting PCs Steve Hartill and Kyle Manns by seizing their clothing and equipment and trying to bend their fingers backwards at Falkirk Police Station, all while on bail. The court heard drinking is a “significant issue” for Gauld, who remembers nothing of the incident. Sheriff Derek Livingston sentenced him to four months’ detention.